I am a cellist studying at the Music Academy of Sarajevo, Bosnia and Herzegovina, and I have been playing on Larsen Magnacore cello strings since 2016. From the second I had these strings on my cello they adapted to the instrument. I was surprised by the new and clearer sound my cello could suddenly make. What was the secret? Two lower strings, C and G, are very pronounced and give a clear and strong basso voice, even in higher positions. Also, they respond in pianissimo extremely well. I was very impressed by the fact that the wolf tone on my cello was reduced with the Magnacore G, which hadn’t happened with any other alternatives I had tried on my cello. Magnacore C&G make it easier to experiment with various fingerings in higher positions that will of course give flexibility with phrasing and colouring the tone. The two other strings A and D are perfectly balanced with the two lower ones and provide clarity, making it possible to have both a warm, smooth and cantabile sound, as well as forte, strong and outstanding tone: making them perfect for soloists. All four strings catch very fast, and give their full potential whilst improving the overall sound of the instrument. For more open and bright cellos, I would recommend the medium gauge. If you play for many hours a day as I do- everyday rehearsals, classes, concerts and so on, you will need durable strings which will withstand all conditions. For a cellist, the Magnacore set offers never-ending possibilities. They are just perfect in giving the cellist complete control of the colour and tone, being able to adjust for sudden changes in temperature, intense humidity or dryness. I was entrusted with solo roles in the orchestra, held my solo recital, and played in a numerous of other concerts with various ensembles and orchestras while playing on Magnacore. My experience is that Magnacore is a perfect set for all situations. 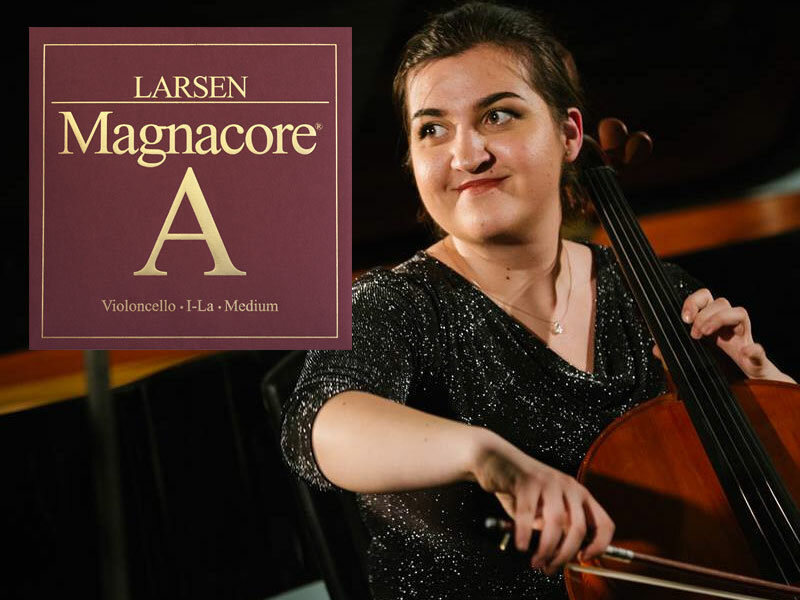 Magnacores have been with me in my most important moments as a cellist and I am full of admiration for Larsen Strings for making such well-crafted strings that have been through so many concerts with me, tours and trips without losing their quality.